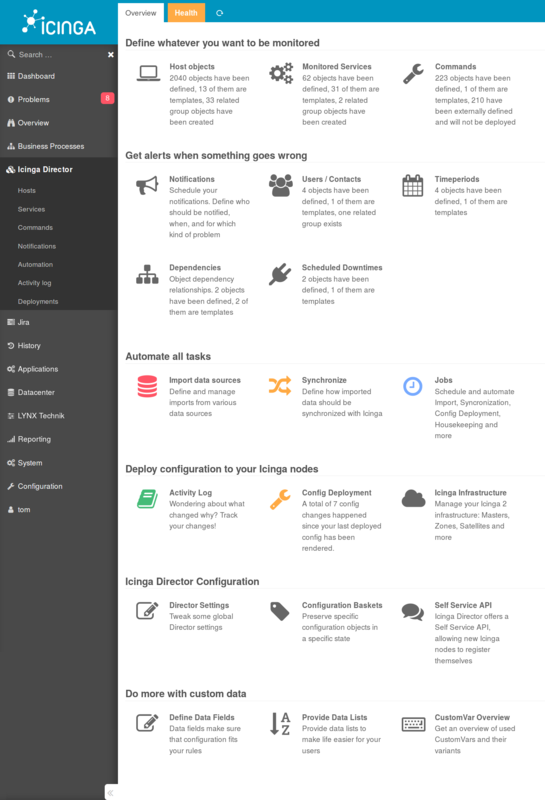 The Director aims to be your new favourite Icinga config deployment tool. Director is designed for those who want to automate their configuration deployment and those who want to grant their “point & click” users easy access to the configuration. What makes Icinga Director so special is the fact that it tries to target both of them at once. Read more about Icinga Director in our Introduction section. Afterwards, you should be ready for getting started. Please have a look at our Installation instructions and our hints for how to apply Upgrades. We love automation and in case you also do so, the Automation chapter could be worth a read. When upgrading, you should also have a look at our Changelog. You could be interested in understanding how the Director works internally. Working with agents is a topic that affects many Icinga administrators. Other interesting entry points might be Import and Synchronization, our CLI interface, the REST API and last but not least our FAQ. A complete list of all our documentation can be found in the doc directory. Icinga Director is an Open Source project and lives from your contributions. No matter whether these are feature requests, issues, translations, documentation or code.